“Mike’s side” had hanging storage above, laundry baskets and a safe below, and piles of clothes and shoes all around. My side was worse. More piles of clothes everywhere. 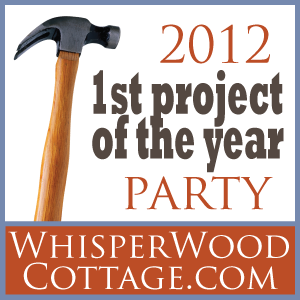 We started this project by purging. We took 10 bags of clothes to Goodwill and it felt awesome. We didn’t wear half the clothes we had and they were just taking up space in an already cluttered area. Here is the closet after clearing everything out. Yes, this old dresser was part of the closet. Really, it just added to the clutter. This was the only shelving we had before. We wanted something more practical for our needs. Ok, you get the point It was cluttered, claustrophobic, not functional, and just plain ugly. Ready for the “after?” I thought so:) Warning: not much talking and tons of pretty pictures ahead. UPDATE: Tutorials have been posted! 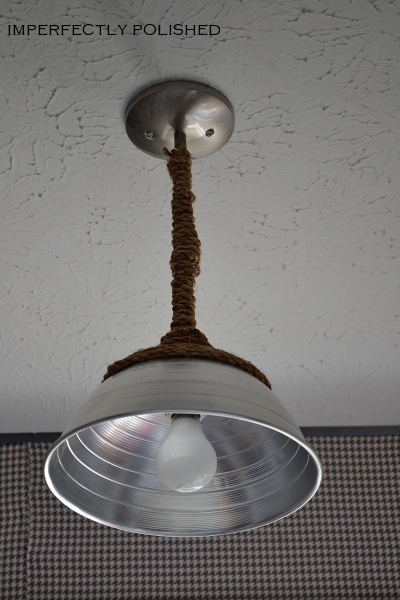 See how we made the DIY storage boxes, DIY pendant light, and easy hat rack! I also shared tutorials on our DIY Roman Shade, the custom shelving wall, and the hanging “His and Hers” side. WOWZERS - what a difference! It looks fantastic! Wonderful! It is so crisp and super organized! 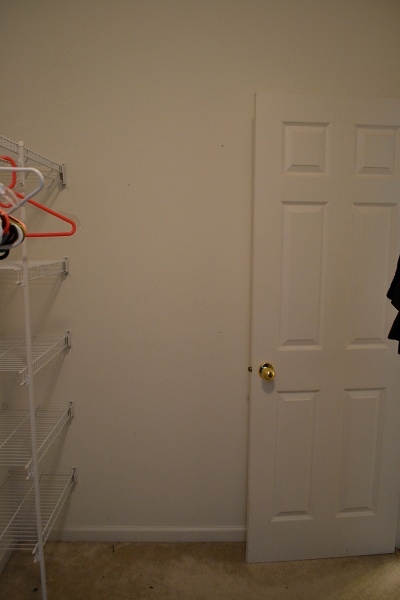 I had a major closet fail quite a few months ago and re-did my closet. I am much happier now that I can find everything easily! Thanks for sharing your lovely photos. I hopped on over from Made by you Mondays. Thanks, Donna! 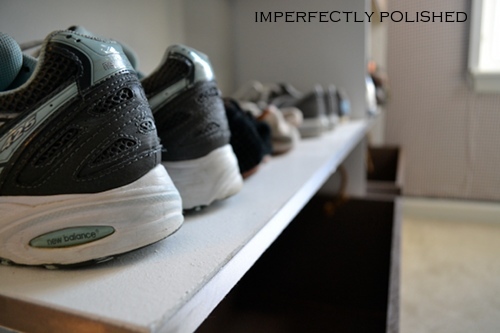 It’s amazing how big of a difference an organized, clutter-free closet makes, isn’t it? Congrats on completely yours! Wow!! It looks fantastic! I am SO jealous…our closet is an absolute disaster. A total redo is in the works soon. (I hope!) Awesome job!! The closet looks great!! Your design skills would make ty pennington jealous! Wow, that is a huge transformation. I give you so much credit for making it so pretty and organized! I host a party on Fridays and I would love if you linked up! Thank you, Jenny! I will definitely link up Friday! Thanks:) It’s finally done haha! Nice closet!! Tell me, where did you find those boxes with rope handles and chalkboard labels? They’re fantastic! Thanks, Ellie! We actually made them ourselves! Here’s the link to our tutorial: http://imperfectlypolished.com/2012/01/10/diy-storage-boxes/. LOVE this! So clean and crisp. I am pining the baskets. Great idea and I love how easy they would be to change. What an awesome transformation! Great job! I am pinning this an facebooking it. This looks amazing! 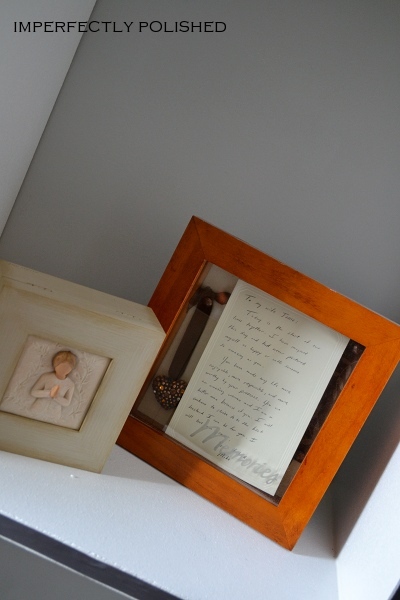 We are working on our closet right now - I love what you did and that everything was made by you! Thanks, Megan! Good luck with your closet! This is fabulous…so tidy and with personality. I wish I would have remembered to take before photos before our mini makeover. Well done! wow! you did such a good job!!! Great job, Jessie! I love your pretty accents and that it’s all so organized now! Thanks, Sarah! I’ll head over and link up! Fantastic job! We redid our walk-in closet last summer, and I LOVE it now. And look at you and your uber-organized chalkboard paint self. Haha those shortcuts will get ya:) I linked up to your party! 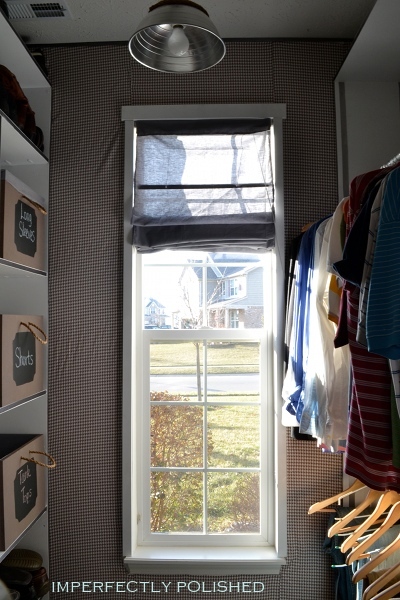 Thanks for coming by…again:) Oh, and your closet makeover is gorgeous!! Wow! Your closet looks amazing! What a fantastic transformation. I can only hope that you’ve been keeping up with it and making sure it stays that organized after all the hard work you did. Haha me too:) The good thing is, there isn’t much room to just throw things like in our old setup. Everything has a place and, so far, we’ve been very good! Thanks for stopping by! Oh my gosh! I am in love with your redo! It looks AMAZING! I would love it if you would link this up to the Tuesday Talent Show this Tuesday at Chef in Training! I hope to see you next Tuesday! This is amazing. 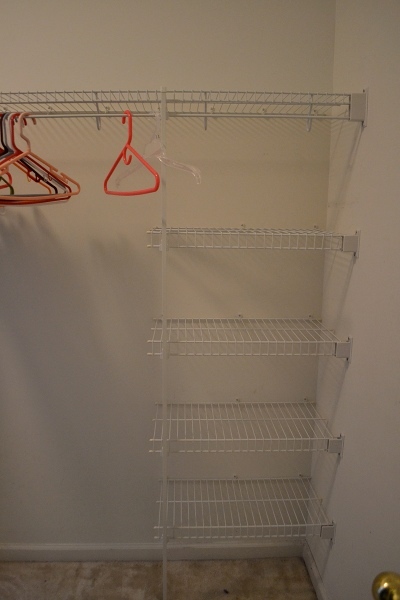 I don’t want to show my closet now…yours looks so much better!! 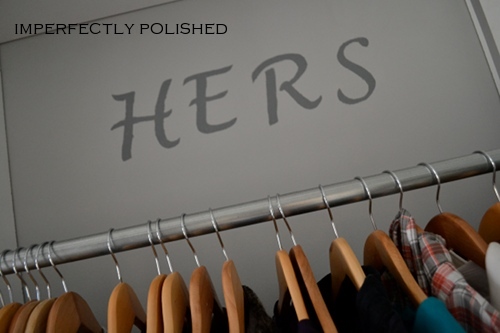 Your closet puts mine to shame even after my makeover! Great job! I am definitely experiencing closet envy! Wow, so organized. Love those chalkboard labels! Thanks so much for linking up. Be sure to grab a button and check our facebook page for weekly winners and contest updates!